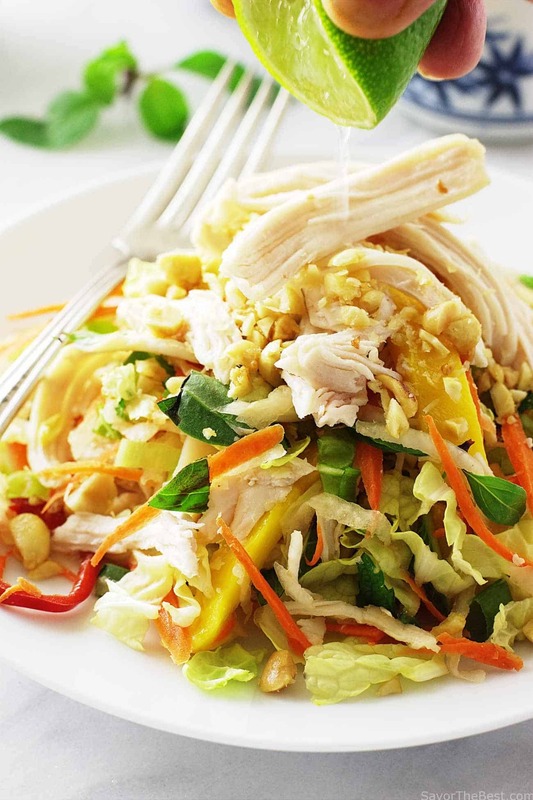 Saigon chicken salad, a taste of Vietnam! 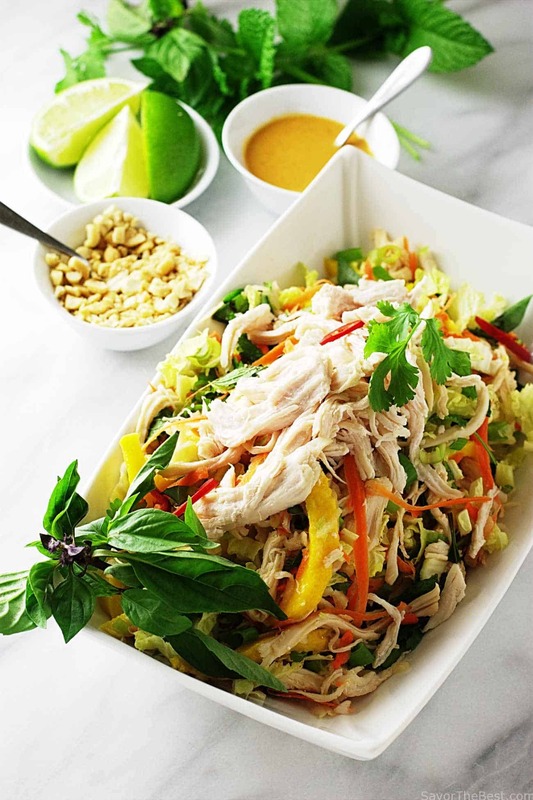 This is a great summer salad with moist, tender, flavorful shredded chicken, a lot of good healthy crisp veggies, sweet mango slices, fresh herbs of Thai basil and mint. 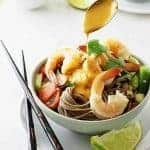 I love browsing through travel magazines and recipes and dreaming of a trip to Asia to enjoy the cuisine from each and every country. Alas, that is not going to happen, so I will continue to travel vicariously through magazines and home cooked recipes. 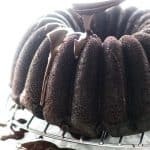 We recently brought you a recipe for Asian Teriyaki Meatballs as an appetizer and a wonderful Beef Pho soup from Vietnam and one of our most popular posts, Black Rice Sushi Rolls. The poached chicken breasts are the main attraction in our salad. They are saturated with flavor from a poaching liquid made of fresh ginger root slices and spicy red chili peppers. 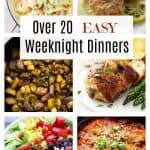 The tender, flavorful chicken breasts are then shredded and a portion is added to the crisp cabbage, mango, carrots, radish, onions and fresh herbs. 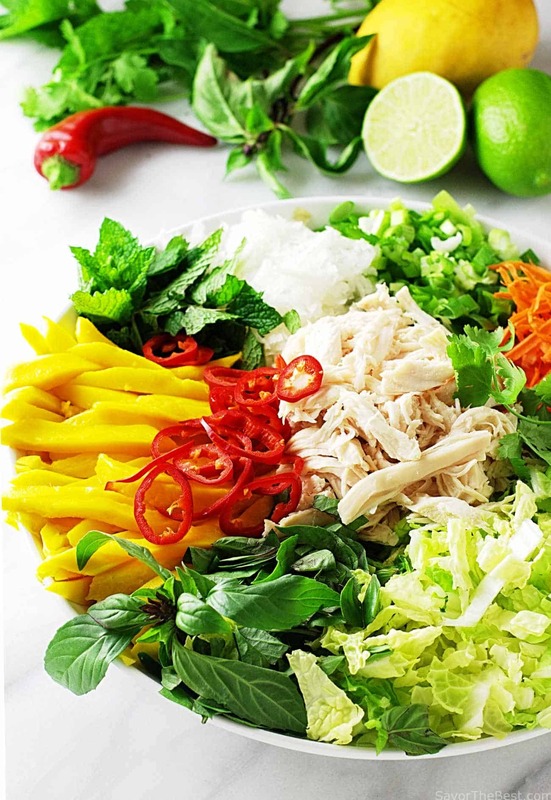 This colorful Saigon chicken salad is a meal-in-a-bowl with a base ingredient of green cabbage. Napa cabbage or savory cabbage can also be used but in my opinion, those regular big green heads of cabbage stay crisp longer. 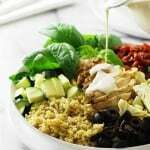 The salad ingredients are enhanced with a simple, tangy vinaigrette made of fresh squeezed lime juice, soy sauce, garlic, pickled ginger and toasted sesame oil. Condiments of fresh lime wedges, salty roasted peanuts and spicy peanut sauce are served with the salad. A commercial peanut sauce may be used or you could use our recipe listed in our Lemongrass Chicken Satay recipe. Both the salad and the lime vinaigrette can be a make-ahead meal that will keep you out of the hot kitchen in the afternoon. 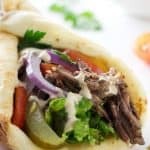 It can be made in the cool of the morning and served for lunch or dinner. When ready to serve, the salad is tossed with the lime vinaigrette and transferred to chilled salad plates. 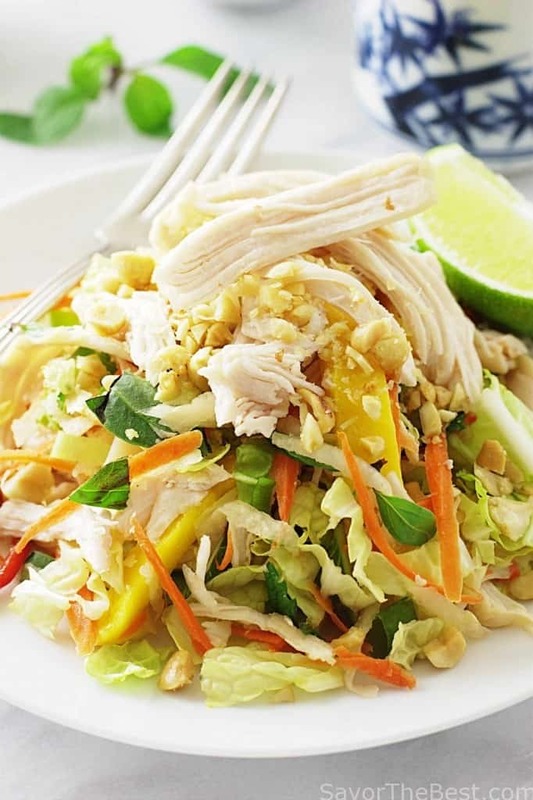 The individual salads are topped off with the remaining shredded chicken and condiments of lime wedges, salty peanuts and spicy peanut sauce are the finishing touches to the salad. 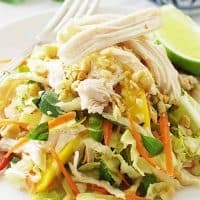 Saigon chicken salad is a great summer salad with moist, tender, flavorful shredded chicken, a lot of good healthy crisp veggies, sweet mango slices, fresh herbs of Thai basil and mint. 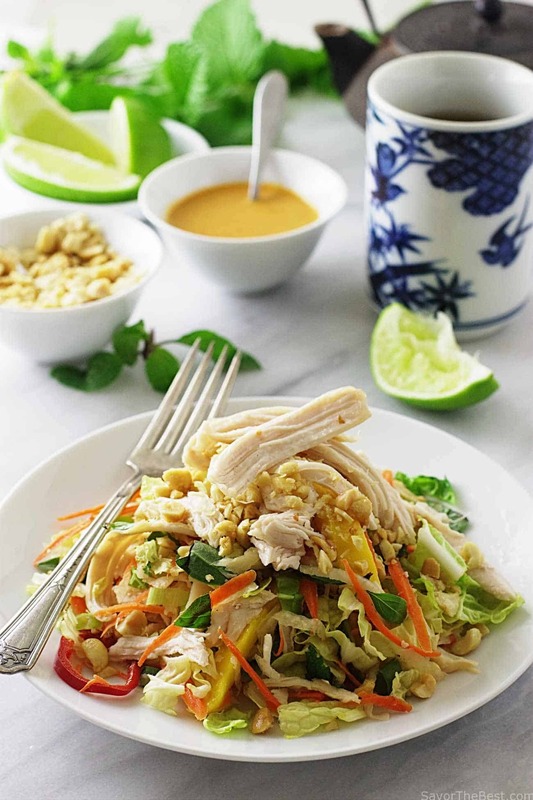 It is tossed with a tangy lime vinaigrette dressing and served with chopped salty peanuts and a spicy peanut sauce. In a deep saucepan or skillet, combine the water, salt, chili pepper, and ginger root slices. Bring to a boil over high heat. Add the chicken breasts (add more water so the chicken is full covered), reduce the heat to low, cover the pan and simmer for 10 minutes. 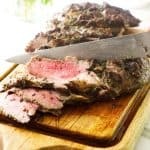 Remove from the heat and let sit until the chicken is fully cooked, (testing in the thickest part with an instant read thermometer to 165°F) for an additional 10 minutes. Transfer the chicken to a cutting board and shred with two forks and place on a plate. Refrigerate chicken until cool. Whisk together the lime juice, fish sauce, garlic, soy sauce, pepper and pickled ginger. Slowly add the toasted sesame oil and whisk to combine. In a large bowl, combine the cabbage, mango, carrot, radish, chili pepper, onions, basil and mint. Add 1/2 of the cooled shredded chicken and the prepared lime vinaigrette. Toss to combine. To serve: Divide the tossed salad between 6 individual chilled plates and top each with an equal portion of the remaining shredded chicken. Garnish each salad with sprigs of basil and/or mint. Serve with lime wedges, salted peanuts and the spicy peanut sauce. Nutrition values represent a portion size, 1/6 of the salad and vinaigrette and without the peanuts and spicy peanut sauce. 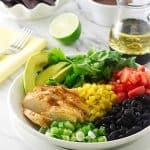 Love the idea to add a chili to my chicken poaching water! And love this salad — so many different flavors and textures going on. Plus it’s gorgeous! Thanks so much. Thank you, John…..The chili does give the chicken a nice kick that tastes great with this salad.